ISAF Sailing World Cup Miami, event 2 of the 2015 ISAF Sailing World Cup series wrapped up with the Medal Races on Saturday 31 July. It was a week of superlatives. Think 678 sailors, 599 boats, 150 races for ten Olympic classes and three Paralympic classes. At the ISAF Sailing World Cup Miami, presented by Sunbrella, we talked of "a racecourse built out of shifts." We spoke of competitive performances that exceeded any comparison to walking a tightrope. Dancing on a tightrope would be more to the point. This truly is the road to the Olympics. Every aspiring Olympic sailor takes a shot at this ISAF series that travels to the far corners of the world, qualifying gold medal winners and top continent finishers to race at the finale that follows the five-race series. The next competition will take place at Hyères, France April 20-26. The finale will take place late in 2015 at Abu Dhabi, U.A.E. It's a mini-Olympics for sailors only. You won't see faces in Rio, 2016, that you didn't see on the road to Rio, this road. You won't see racing that is any more competitive. No, just sailors hardened in this crucible, playing for the highest stakes. This is the proving ground. And as one winner put it, on to the next one. The 2012 Olympic gold medalists from New Zealand, Jo Aleh and Polly Powrie, wrapped up first place here on Friday. That made the Medal Day "enjoyable," Powrie said. "The pressure was off, so we just went racing and enjoyed the day." For the 2012 Olympic silver medalists from the UK, Hannah Mills and Saskia Clark, there was more to do. "The gold was gone," Clark said, "and we had a nice gap over third [19 points] but the conditions were such that this was never going to be a simple race, and it was going to be hard to defend. At one point the Japanese team was way ahead, and that was a problem." Ai Kondo Yoshida and Miho Yoshioka won the Medal Race and finished third, for a bronze, by five points. It's not their first time on the podium. As obvious medal prospects for Rio in 2016, the duo look forward to "some local racing around Auckland," Powrie said, "enjoying the rest of the summer, and then getting ready for Hyères." 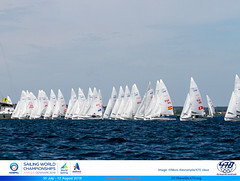 As in, the ISAF Sailing World Cup Hyères. Home continent qualifiers for the finale at Abu Dhabi were Anne Haeger & Briana Provancha (USA) and Fernanda Oliveira & Ana Luiza Barbachan (BRA). 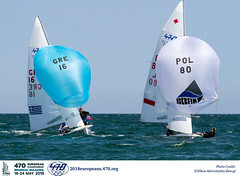 Luke Patience and Elliot Willis of Great Britain went into the Medal Race leading their Australian opponents and wrapped it up the same way. Even among the regulars on this scene, Patience was unusual for finding the extremely shifty sailing conditions also, "Not unusual. We had lots of northwesterlies, and what was unusual was having that for a week. We go all over the world, and wherever you are, you have to adapt." Patience and Willis arrived in Miami two weeks ahead of the regatta, "to focus, to treat this the same way we would treat a world championship." It worked. To overtake the British team, a good race by Aussies Mat Belcher and Will Ryan was never going to be enough. For them to move into first, it was going to take that and a bad race on the part of Patience and Willis. Not a likely bet. Belcher and Ryan in their turn had a cushion over third that made the strategic outlook, Belcher said, "Simple. Try to be in front; try to get as many points back as we could. When you get to this level of competition, it's about minimizing the risks. But it was a tricky day. There was more wind than we expected, 12 to 18 knots, and the water was chopped up by a lot of commercial boats. "The fact is, this has been a difficult week for everybody." Onan Barreiros and Juan Curbelo Cabrera of Spain entered the Medal Race third with only the New Zealanders, Paul Snow-Hansen and Daniel Wilcox, close at two points behind. A disappointing day for Snow-Hansen and Wilcox handed the Kiwi pair 20 points for a 10th-place finish, dropping them to fifth. 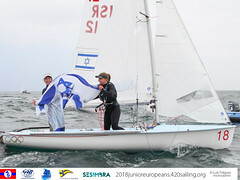 The Medal Race went to Sofian Bouvet and Jeremie Mion, the defending champions from France. Home continent qualifiers for the finale at Abu Dhabi were Stuart Mcnay & David Hughes (USA) and Geison Mendes Dzioubanov & Gustavo Thiesen (BRA). High resolution, free for editorial use images will be available to download view US Sailing's Flickr account here. For specific requests please contact the ISAF Communications Department below.